I also vote that Haifisch, in his wisdom and experience, should get the tiebreaking vote whenever we're all too indecisive to move things along. Her. And I'd agree, but it's usually not too much of a pain to wait a few minutes for a tiebreaker. Maybe I should just do that when it's a relatively minor decision, like deciding between giving the guy 25 cows or 20 cows? We're out 50 food and 28 goods, but we got happy women in return. 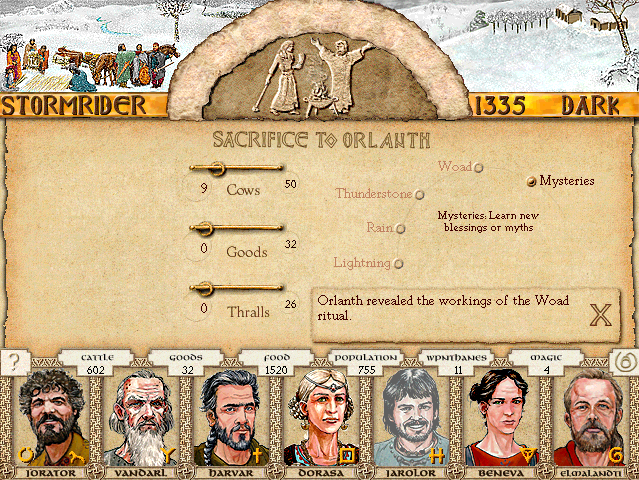 ...but I'm going to go on a long shot and see if Orlanth teaches us about his quests first. Worst case scenario, we get one of his various not-at-all-bad blessings. If nothing else, we need to wait until Jarolor's back so that we get the bonus from having 7 different gods represented by active ringmembers. Woad reduces deaths and injuries among our farmers. Handy. 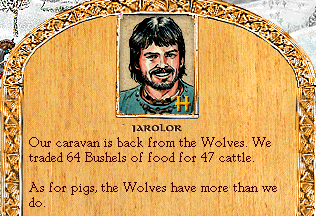 I send you with a large caravan and you only managed to trade 64 bushels of food? What did you do, eat the rest? 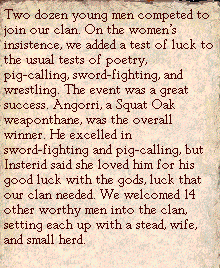 The warriors of the Squat Oak clan have massed among your boundaries. They demand safe passage through your tula so they can attack the Wolf tula by surprise. They have long been feuding with the Wolves, but the conflict has recently been aggrevated by the killing of Squat Oak horses, which the Squat Oaks blame on the Wolves. 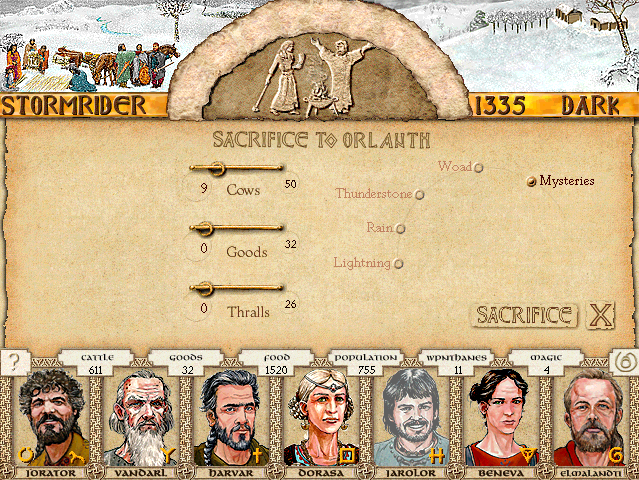 -Allow them to travel through your lands. 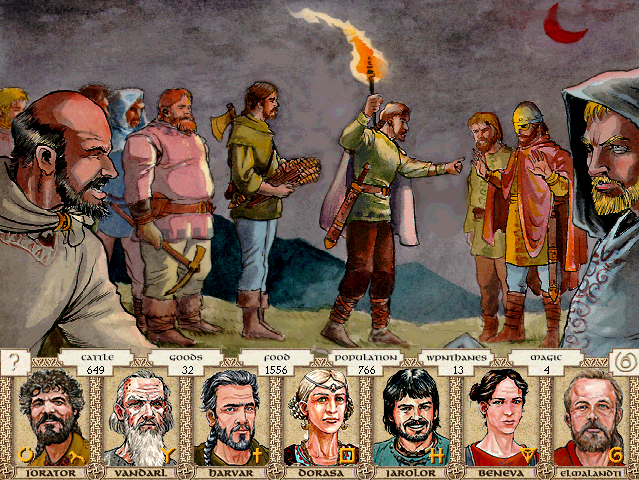 -Offer to make peace between the feuding clans. -"Please do not involve us in your feud." We owe it to the Wolves to turn them back. We are obligated to protect our ally's interests. Allies are too precious to waste. He who sows the seeds of war reaps only sorrow. Right. And when they're finished burning out our allies, maybe they can come back and burn our market. Bad King Urgain allied with the Odrangi just to learn where they were weakest. Then he burned them alive.